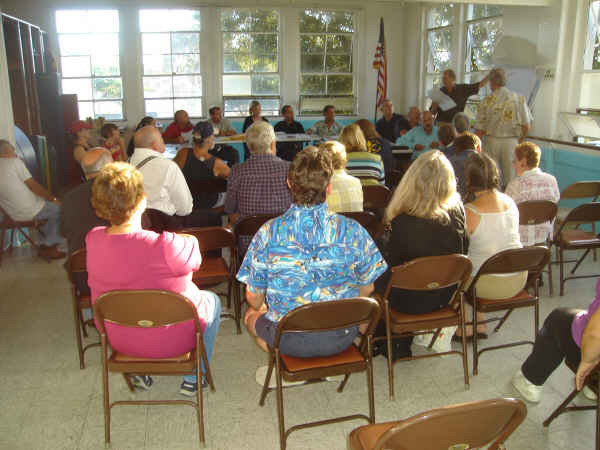 The OB Planning Board meeting, August 5, 2009. With the upcoming OB Planning Board election on March 9th, and the Town Council’s planning board candidate forum on Feb 24th, we thought it would be swell if we got to know the current Board members and the candidates. The Ocean Beach Planning Board covers, of course, the OB Planning area, which is broken down into 7 districts, and each district has two seats on the Board. Once it is seated, the new board after every March election, selects its Chair and other officers. The upcoming March 9th election is being held to fill vacancies and to comply with the cycle of having one seat in each district open for vote annually. In one district, two seats are open, and in several districts, no one is currently running for the open seat. Here is a really brief break down of current members on the board and some info on the official candidates. Nancy Taylor– Current Board member. A resident, Ms Taylor has been on the Board for 3 years. She’s a para-legal and has a fine arts degree from SDSU. She has also been on the Precise Plan Update Committee, and other sub-committees. She also attends the OB Rec Center Council as the Board rep.
Ronson Shamoun– A current member and candidate. Mr. Shamoun is the owner of two Subway franchises in Ocean Beach, OB Quik Stop Market, Café Bella as well as Newport Quik Stop. A native San Diegan, Mr Shamoun has a legal and tax background. Landry Watson– A current member and candidate. A veteran and former Navy Seal, Mr. Watson is one of the resident Board members, past Chair, and is very active in internal Board committees. With a B.S. in construction management, he works for a San Diego General Contractor in the construction industry. He also touts himself as “a tireless advocate for green building, sustainability and energy efficiency…” Watson used to represent District 2. He is also the vice-president of the OB Town Council. Amanda Lopez – Current Board member and is not a candidate. Ms Lopez is a resident and has been a long time member. Mr Sparling is a new candidate, a poet and part-time comedian, and he is a supporter of progressive causes. Ms Schmidtknecht, formerly the payroll manager at Lakewood Building Systems, Inc., a construction firm, is new to the planning arena, but not to community civic activism. She has been involved with the OB Tree Committee, the OBMA street fair, and served on the Board of Directors for the Ocean Beach Town Council. Heather Kwiatkowski– current Board member and not a candidate this time around. Ms. Kwiatkowski is an environmental consultant, specializing in cultural resources. She has degrees in Anthropology, including a Masters from San Diego State University. Mr Klein is an attorney and has been active in local community affairs. He is married to Julie Klein, owner of a local business, who also is very active. We think both of them surf. Seth Connolly- current board member. Right now, Mr Ingolia is the Enrollment Advisor for Ashford University,and has been an educational manager, has been involved in the real estate industry, and land management. His schooling includes geography and urban development. Mr Ingolia was in District 3 but is now running in the 5th. George Murphy– Current Board member but is termed out. Mr. Murphy has been a representative since March of 2002, plus has been active in the San Diego River Coalition; Friends of the OB Library, the Ocean Beach Precise Plan ‘Rewrite’ Committee, and OB Community Development Committee. Mr. Murphy is a retired educator, and has also has been active in local gay and Democratic politics. George moved to OB in 1977 where he owns, lives in, and manages a 5-unit apartment building on Cable Street. Robert Sullivan– current board member and not a candidate. Mr Sullivan is owner/ manager of the Blue Parrot restaurant, and is a resident of Pacific Beach. Jane Gawronski – current board member and not a candidate. Dr. Jane Gawronski is a retired educator having served as superintendent of the West Covina Unified School District and the Escondido Union High School District. She has a Master’s degree from the University of Idaho and a Ph.D. from the University of Minnesota. She and her husband Tom have been a mainstay couple on the Board for years; they’ve been active in local Democratic circles, and are local property owners. Tom Gawronski– current board member but termed out, is not a candidate. He is the current Election Chair. Ms Capelucci owns and manages luxurious vacation rentals in OB, called the Ocean Beach Bungalows. Brittany Taylor– current Board member and current Chair. Is not a candidate this time around. Ms. Taylor has been active in the Ocean Beach Community since 2006. She graduated from the University of California San Diego with a B.A. in Political Science. She and her father Michael have both represented District 7 for the past two years. Michael Taylor– current Board member and not a candidate. Mr. Taylor has been active in the real estate industry as a contractor, a developer, a manager and a broker for almost two decades. He is licensed in the State of California as a general engineering contractor, a general building contractor, and as a real estate broker. According to Chairperson Brittany Taylor, there are two candidates in 1 and 2, 1 in 5, 1 in 6, and none in 3,4,and 7. This could change and also does not include any write-in candidates. Tom Gawronski is the Election Chair, but there is no info on how to contact him on the Board’s website. Here’s a link to a recent post that includes the OB District map. Plus check out two recent “rants” on the planning board here and here. very interesting array of candidates….thanks frank! looking forward to more info as it comes in. On the Board’s website, I found the “map” that shows the boundaries of each district. I was hoping it would make for a good addition to this article, but the “map” is simply a photographed piece of paper with black lines drawn atop a hand-drawn street map. As sad as it is, it would be helpful to have the “map” posted here so people know which district they live/work in. Thanks! Mark, thanks for the suggestion. I have now included a link to an earlier post that has the district map, plus links to two recent articles on the Board. one of the fears is that the board will be dominated by business and real estate and construction and developer people. from the looks of this review, we’re well on our way to that goal. which means ordinary residents and small business owners need to re-assert their / our interests. you could always run for a seat yourself! more people like to criticize others that actually want to get out there and help thier community! So, instead of sitting behind your computer, why don’t you get out here and do something! it’s easy, all you have to do is care and start volunteering! oh, and it seems like it’s only your “fear” unless YOU do something! I am proud to be a candidate in district 2, looking forward the election. Dave, why don’t you send a little info on yourself, and post it in the comment section here. For 20 + years I have lived in San Diego, the past 10 in Ocean Beach, I consider OB home and have volunteered on the OB Tree Committee along with the OBMA street fair. I have also served on the Board of Directors for the Ocean Beach Town Council. The reason I want to serve on the OB Planning Board is simple, I want to preserve our local style, maintain the neighborhood atmosphere which includes owner operated business, the Historic Beach Cottage District and have a voice on new growth and development in my community. I’m able to commit to a two year term and volunteering is becoming a way of life for me, one that I plan on continuing in Ocean Beach. My wife and I moved to OB in October of 2006. I was a Zonie for years, my father owned a nice beach house in Mission Beach, I was born in Phoenix, Arizona July 12th 1933. We fell in love with OB real quick, joined the historical society and then just by chance I picked up a flier at the OB Fluff & Fold. I always wanted to be a writer but used the excuse I did not have a loft in Greenwich Village or a cabin in Key West, so how could I be a writer. OB became both to me and then it was poetry followed by events beyond my wildest dreams. I worked for my fathers civil engineering business and attended many a planning zoning meeting in front of the Phoenix P&Z. If elected I will work hard to keep my new last home town a place its residents can be proud of and our visitors pleased enough to keep returning. Quick point of clarification. Michael Taylor has served on the board for five years and during that time he served for three years as vice chair. And I have served on the board in 2006-2007 and 2008-2010 a total of 3 years. I just want to point this out because there was a time that we had several vacancies on the board and no one was willing to run for the planning board. Several things have changed. The Ocean Beach Planning Board is one of the most involved boards and tries to reach out to the community. We have a website, a page to try to give information on board representatives(this is the first year we have had this), and several other measures to increase public awareness that many other planning boards in San Diego do not provide. Older Article: Should Progressives Confront Up-Coming Tea Party Rally?